When the Leonis and Draconis servers were merged in 2015, a new clan system was implemented. Since this system is new to ROSE, many players are still confused about how it all works so this is a little guide to help clear things up. You must be at least level 30 and not be in a clan already. There is a fee of 1million zulie and the character making the clan must have that amount on them. Talk to [Clan Manager] Burtland to create a clan. He is located in the City of Junon Polis at (5289, 5264) near the Honor Shop NPC’s. Choose your clan name, clan slogan, and clan mark. If you want to add your own unique clan mark once you have made the clan, check one of the topics here for details on how to do that. If you want to add a color or change the color of your clan’s name, you can choose from standard colors by talking to Burtland. The price is 10 million zulie. For some fancier options, a Clan Name Colorizer is available in the Item Mall for 500 points. At first your clan will only have 5 spaces in it. One of them is you, the clan master, so that leaves 4 spots that you can fill with other players or more of your own characters. To kick someone out, click on the person’s name from the clan list in the clan window and then the word “expel”. There are 6 possible ranks in a clan. The clan master decides who is given a rank and how many people will have that rank. Each rank has abilities that are set by the game itself, so be cautious when choosing to promote clan members, Here is how it breaks down. Both the cm and dm’s can do all of the following: add members, kick members, promote/demote members, change clan mark, change clan slogan, change MOTD (message of the day) and can increase clan skills by using the clan points earned by the clan. Can add members, kick members, promote/demote members and can increase clan skills by using the clan points earned by the clan. No special abilities. Everyone starts off as a rookie. NOTE: A member can only promote/demote other players with ranks below their own rank. With this new system, clan points can be earned by everyone who is level 30+. Fighting monsters around your level will earn clan points for the clan. You can see how much you are getting per kill in the system chat. Placing the cursor over a clan member’s name in the clan list will show how many clan points they have contributed in total. Although it is no longer necessary to farm for clan points in a clan field, monsters in both clan fields do still drop them. To enter Junon Clan Field, you must be between level 30 – 89 and have the rank of Commander or higher. The only requirements to enter Luna Clan Field are that you must be at least level 70 and be in a clan. Clan Point Boosters are also available in the Item Mall. Some clan skills are permanent while others are temporary. Check this wiki page to see all of the possible clan skills. Click on each skill name to go to the wiki page where you will find a chart showing how much it costs to raise the skill each time. I think that pretty much covers the basics of clans and the new system. Please let me know if I have forgotten anything or if something I’ve posted is incorrect. Edited by HoneyBunz, 11 April 2018 - 08:26 PM. I thought the command was @/clan invite name or something. when you write it in clan chat... what HoneyBunz said... then you have the @ automatically. then the... /clan invite name-of-the-person... is fine. I know, I was pointing it out so she could specify that in her original post. but what about outside* of it. Edited by Feuer, 05 November 2016 - 10:38 PM. Thanks for the suggestion! I edited the post to add that as an option. I just checked and all of my clan's skills are still working. Maybe you had some of the 30 day passives and the time is over on them or something. 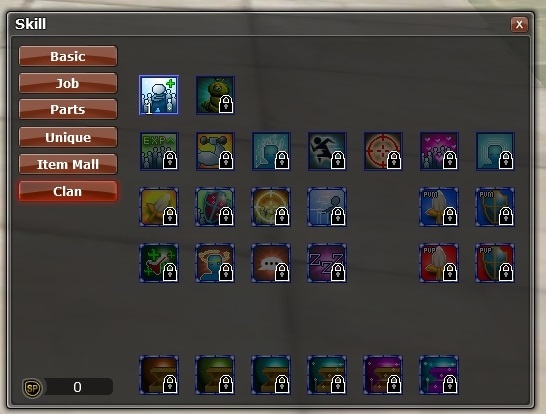 The stat passives, mount speed passive and experience passives are all permanent but the rest are only temporary.